Website.com is a drag-and-drop solution for building your website. Whether you are a beginner or a pro, Website.com has everything you need to create, publish your website, blog or online store, no technical skills needed. 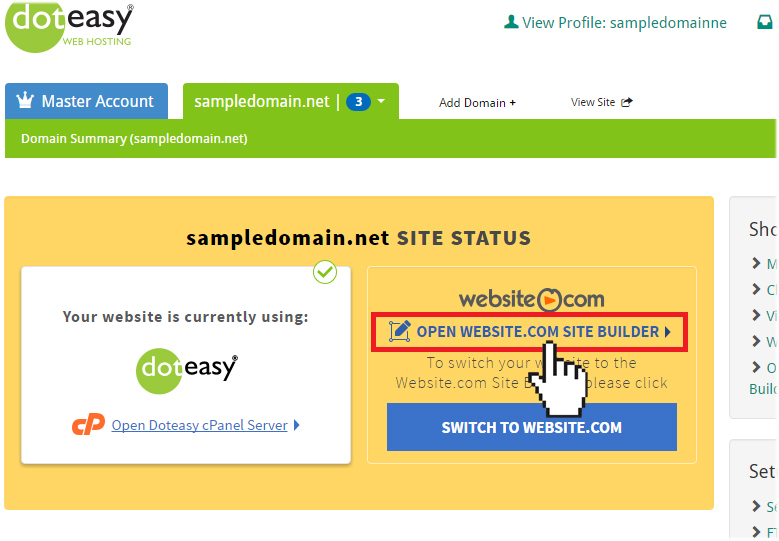 To get to Website.com simply login to your Doteasy Member Zone and click on Open Website.com Site Builder. Note: if you have never used the Website.com Site Builder, you will see a different image. You can click the Start Now (It's Free!) button to access to the Website.com Site Builder. The first step in building your website is to select a design template. Website.com comes with hundreds of templates to choose from, all of which are mobile-friendly and created to adapt to a variety of purposes and needs. You can take a look at the templates through Website.com’s Template Library. Watch this quick video to learn how to select a design theme for your Website.com website. All of Website.com’s templates are pre-populated with sample content, including text. The sample content is intended to give you a head start by showing you the content you can have, and a possible way to arrange them on your web page. Your next step will to replace the sample content with your own text and images, etc. Watch these two videos to learn how you can easily add your own content and elements to your website. Once you have picked a template and customized it with your own content, you can publish your website using the one-click Publish button. For more information on how to use the features and tools on your Website.com editor, check out the Website.com Knowledgebase.